Like I mentioned here, last month Jose and I celebrated 8 years of marriage. We’ve been blessed in each other, but it’s so easy to slip into taking each other for granted. I’m sure that’s true of every relationship, but with marriage we have to be especially careful not to allow that to happen. It’s appropriate that last month I opted to read and review Deb DeArmond’s latest book: I Choose You Today. This is targeted at Christian married couples. Married for nearly 38 years, author Deborah DeArmond and her husband have made the spoken declaration, “I choose you today” a regular part of their communication. It’s when we least feel like saying it that we need to remind ourselves that love is a choice, not a feeling. 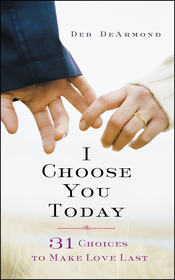 I Choose You Today features 31 scriptural principles that support marriage and help couples develop healthy behavior. Built on an introductory anecdotal story, each chapter has an inspirational takeaway of not only what to do, but how to begin applying the principles immediately. Thought provoking questions create talking points for couples to explore their own choices and experiences in each area serve to generate open dialogue of discovery. I Choose You Today is not a book of “shoulds,” but one of clearly identified choices that each individual can make to grow their marriage and align it with the word of God. Every saying ends with a conventional wisdom quote. The book is filled with biblical inspiration, personal stories, conventional wisdom, discussion questions, and prayers—everything needed to turn a good marriage into a great one. professional speaker, Deb focuses on topics related to women and the family as well as business. Deb is an entrepreneur, having owned her own leadership training and coaching practice for 15 years. She is the co-founder of MyPurposeNow http://www.mypurposenow.co and serves as a featured writer for two online magazines. Her first book, Related By Chance, Family By Choice, is the story of two women who love the same man: mothers and the women who marry their sons. I Choose You Today is a well-written reminder that marriages are not exactly ‘made in heaven’. It takes time, willingness and a whole lot of daily choices to make a marriage meaningful. 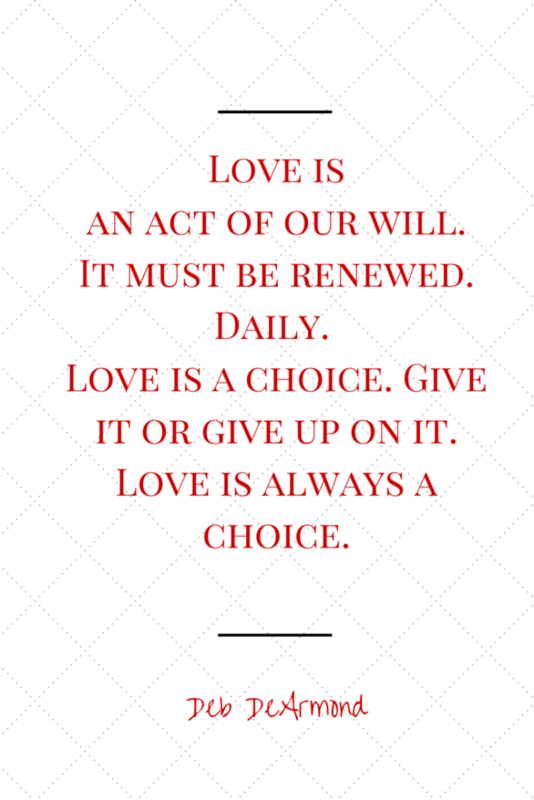 Loving and living with your spouse takes making a daily choice. The book, filled with personal stories, tips and scripture references and conventional wisdom, can be used as a devotional and a couple or a study group can work through the questions provided at the end. I like that the author handled sometimes difficult issues like communication styles, intimacy, personal insecurities, etc. I Choose You Today would make a perfect gift for a Christian couple especially those starting a life together. Check out the I Choose You Today Challenge here. I recevied this book from Litfuse in exchange for an honest review. Books like these help us remember that marriage is an active organism, living and in need of nurture. So important to acknowledge each other in a marriage..Taking one another for granted becomes so easy but it’s important to appreciate each other and acknowledge that we chose each other.. I remember reading your earlier post on ‘I choose you today’! It is such a simple yet powerful statement. They say, the difference between an ordinary marriage and an extraordinary marriage is in giving just a little ‘extra’ every day, as often as possible, for as long as both the partners shall live. It is a choice you make! It would be nice to think that couples could remember what connected them in the first place. I really like this. I choose is such a powerful statement.